There are two ways to react when you're subjected to a problem. One is to grab the bull by the horn and bring it down to its knees. Simple words, tackle the situation. Another way, and the easiest one, is to walk away from the situation, so far that the heat of the issue doesn't burn your skin anymore. 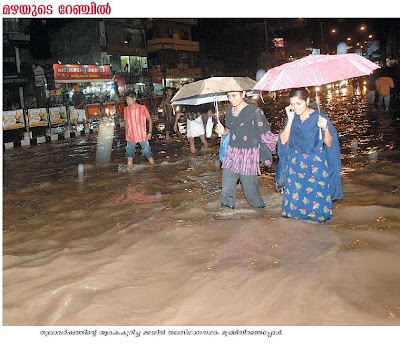 This is the option which seems to have attracted the Corporation of Trivandrum when it came to dealing with a perennial trouble: the floods in the city center. Ever since Trivandrum grew out of its walls half a century back, the residents have been tormented by this menace after even the slightest drizzle. And after torrential monsoon rains the city roads morphed itself into an elaborate canal system mimicking Venice at its best. 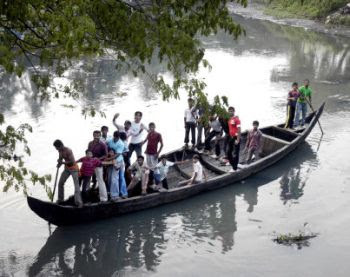 The major vessels of the city system got clogged, including the biggest market of South Kerala- Chalai, the City and long distance Bus Terminals, the Central Railhead and hundreds of offices and commercial establishments. Not to mention the poor public getting stuck in knee and chest high, murky waters, with no way of reaching dry grounds. 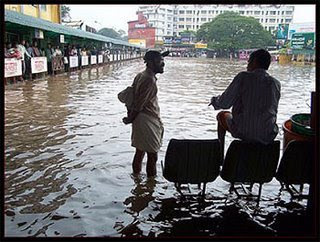 Trivandrum Central Bus Terminal after a rain!! With Trivandrum being the focal point of road-rail transport in Kerala, disruption in the Central terminals meant disintegration of the whole system, statewide. The signal and control gadgets of Railways went haywire during floods, costing the system crores in repair alone. 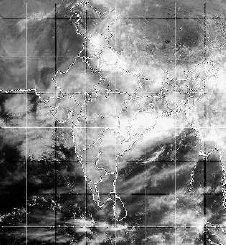 The capital city brought to a standstill just in one bout of rain was a common feature, and all this went on for decades right under the noses of the authorities. For the past 60 years, as much as 75 crores have been sacrificed at the alter of the 'flood management works', including the redesign and elevation of 2 culverts and roads, but the pest is still at loose. The ladies and gentlemen in the above pics appear delighted and amused, may be stirred by the flash, but this is no water theme park to go on a fun ride. Those waters have washed up all the slop, sludge and sullage from the nearby canals and you wouldn't want your dog take a plunge in it. On quizzed about this early this year, our CM Mr. V. S. Achutanandan urged that Trivandrumites should bear with the floods, and experts from outside the state will be called in for a solution. In the meantime the authorities came up with an ingenious plan to solve all the problems... Shift the Bus and Railway stations to the suburbs! An official at the Corporation went on record saying that Kochuveli Railway station and Enchakkal Bus stand will solve the ailments caused by flooding in the city! This may just mean the end of the road for the businesses and residences around East Fort and Thampanoor...Those new developments should be planned and developed as per the needs of the neo-town sprouting along the Bypass, and not as a face saving escape from the floods in Trivandrum. The drains and canals must be cleaned and deepened, ensuring speedy drain of stromwater from the city center. The TS Canal, rather called Parvathy Puthanar, the misnomer waterbody cursed into carrying the mire of the city, must essentially be desilted and made navigable. Urgent measures be taken to prevent seepage of sewage and waste products into the Canal, which has the potential to turn Akkulam lake into a filth-swamp. All too easy to tell, but this is where our system beats us... lock, stock and barrell. To carry out the plan of action we need the assistance and co-operations from various Govt Departments like the Corporation, Water Authority, Public Works Dept (PWD), Railways, Telecommunications, Environment Ministry and all those contraptions in the system, which is almost impossible to achieve. Each dept does things on their own, leaving big chunks of work to others... This happened during the widening of the Amayizhanjan Canal, when the PWD workers encountered a Water Authority pipe line while digging...The digging halted, and never restarts because those pipes were never realigned. A key canal crosses under the railway platforms in Trivandrum Central, but no excavations and cleaning is possible because it may harm the structural integrity of the tracks. TS Canal was desilted and all the sludge poured into the banks, turning the environmentalists and residents against the works. And the succeeding rains washed up all the deposits back into the canal..